This document provides a state-of-the-art review to support the conceptual and practical development of the DESSIN ESS Evaluation Framework. 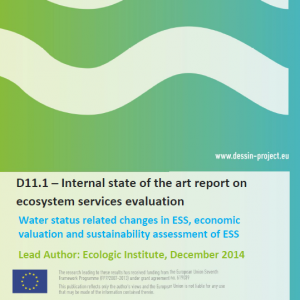 It briefly presents the state of affairs regarding the measurement of changes in ESS, including description of existing classification systems, analytical frameworks and economic valuation methodologies. The challenges associated with spatial and temporal variations of ESS are considered and an approach to define and measure sustainability is presented.